For the first half of this month we travelled almost 10,000 km overland through Japan. The latter we spent in the most basic regions of rural Thailand. I think, if ever we deserved a break, it was now. Following a quick stopover in Bangkok we arrive to Phuket just in time for the midday heat and still wearing our thick clothing and clumpy shoes. From here we are whisked almost instantaneously from travel mode, to holiday mode, via a rather swish pickup in a Mercedes Benz. VIP treatment. Between the airport and our luxury pool villas at Anantara Vacation Club (Mai Khao) we are pampered with refreshments, cold towels, juice and floral bracelets. With a brisk check-in we then find ourselves set in holiday mode nibbling fresh fruit from our complimentary basket of sweet mango, dragon fruit and rambutan, the testicular fruit. 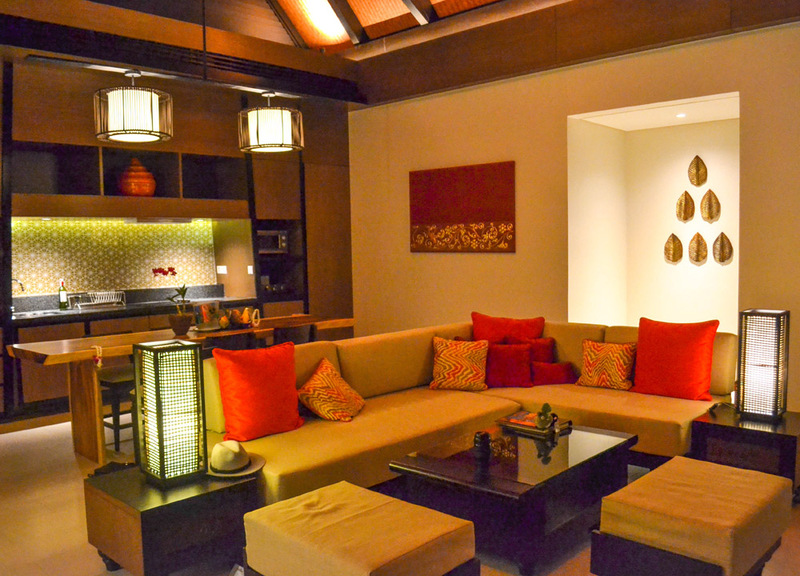 The villas at Anantara are contemporary, in Thai design, with traditional tall roofs for air circulation and coolness. The interiors are set in Thai accents and come decorated with homey knickknacks, yet they don’t go overboard in that it doesn’t feel theme-y. Almost the entirety of the front villa wall is floor-to-ceiling glass which perfectly showcases the villa’s private pool. With pools, at pool villas, I will always look for two things. Warm water and privacy. Obvious, right? In the past we’ve had pools so cold our teeth won’t stop chattering and, with lack of privacy, we’ve had footballs kicked over low rise walls followed by kids who scamper through the hedges. These scenarios completely ruin the pool villa experience and I feel they defeat the purpose of having a private pool in the first place. Anyway, at Anantara Vacation Club, the water is perfect, and the walls build high on all sides meaning you can do pretty much anything, like practice your snorkeling, away from prying eyes. 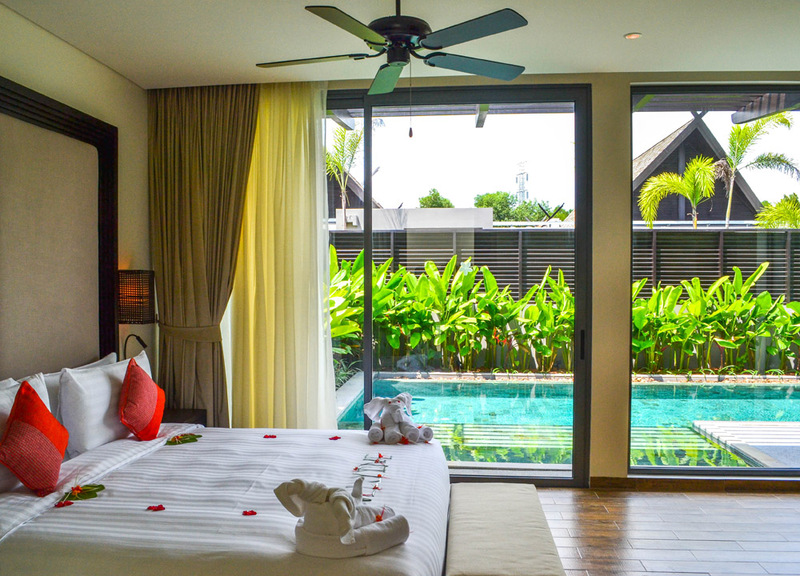 The bedroom features sliding doors which allow you to slip straight out of bed and into the warm salt water pool beside. With pools I personally prefer salt water simply because it gets rid of that annoying chlorine odor which likes to follow me around. Between swimming and lounging we do explore the resort to find plenty of eating options. After two weeks, with no option but Thai food in rural Thailand, it was hard for us to see past Crust, Anantara’s wood-fired pizza bar with half-and-half pizza options. We share a panaeng chicken pizza, with happy hour cocktails. Have you ever sipped Piña coladas from a coconut? Probably worth the visit alone. After a red sky sunset we pick up groceries from Turtle Village, a convenient mall sat directly opposite, with a small supermarket, shopping and various genres of eating and drinking options. After my mismatched breakfast of chicken tikka with naan breads, and sushi with silly amounts of wasabi (I’m on holiday) from the international buffet, we join an early bike tour through the Mai Khao beach area. 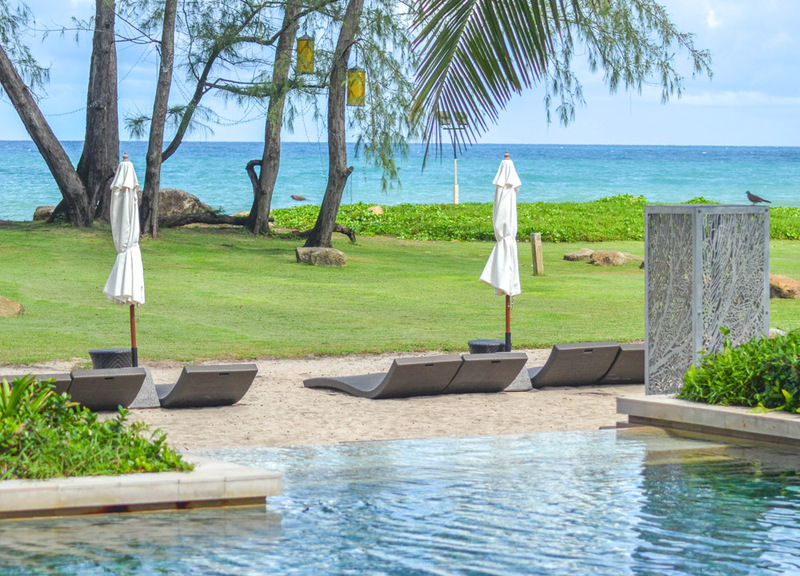 We have explored this area in the past and this would in fact be our third visit to Phuket, where we’ve stayed in 4 different pool villa resorts, dotted in different parts of the island. Yet we find ourselves back at Mai Khao beach and we’d happily come back for a third time, forth, fifth. On an island not so different in size to Singapore, Mai Khao offers the perfect escape from over-development and the hard-sell found in the south. Here it feels like a different world, void of tourism, yet with just enough to offer to keep you excited and entertained. So the bike tour explores the local area, circling the perimeter of an untouched lake, then follows back towards the resort along a beach road. We find next to no tourists on the ride and an unusual amount of wildlife. 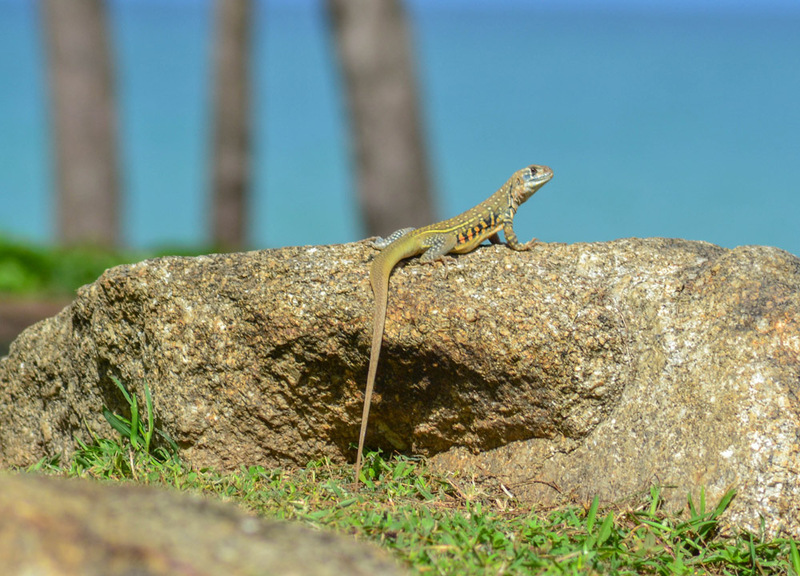 We stay at Anantara during rainy season and, following a rain shower earlier in the morning, the sun was now out and beaming down on the ging-ga garden lizards who bask on the lawns, paths and rocks along the beach. In the trees, and hopping between grass are hoopoe birds who pick at grubs with their thin tapering bills. It’s a beautiful area to escape to. Anantara comes right down and overlooks the beach here, and the complimentary bike rental makes it easy to reach. For the lazy, there’s also a buggy shuttle service to the beach front. We’re from a very different school of cooking, where, for the past 6 months, we’ve been learning from local grannies in the ruralest parts of Thailand. This means; no recipes, next to no prep work and cooking takes place over stoves fired with twigs and coconut husks. 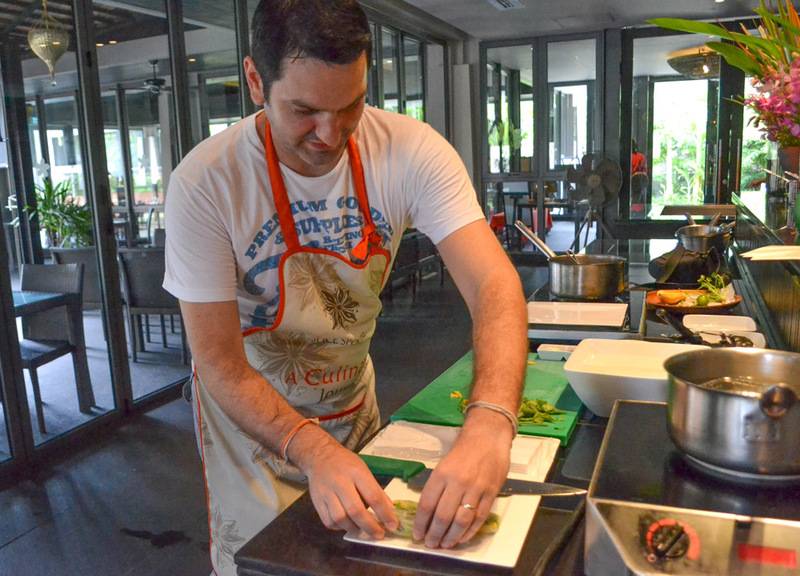 The experience at Spice Spoons was therefore invaluable where we learn the more technical side of cooking Thai cuisine, with things like the skinning of galangal, or the de-seeding of limes. Plus it is great fun. However, the menu was more intriguing than expected. While they do offer familiar recipes such as Som Tam papaya salad, and Tom Yum hot and sour soup, it is also brings a mix of lesser known dishes. A personal favourite was Poh Pia Sod (fresh spring rolls), which may have been nicked from the Vietnamese, but in no doubt, at Spice Spoons, was made uniquely Thai with a twist of fresh cut sweet mango, and a fiery chilli dip. 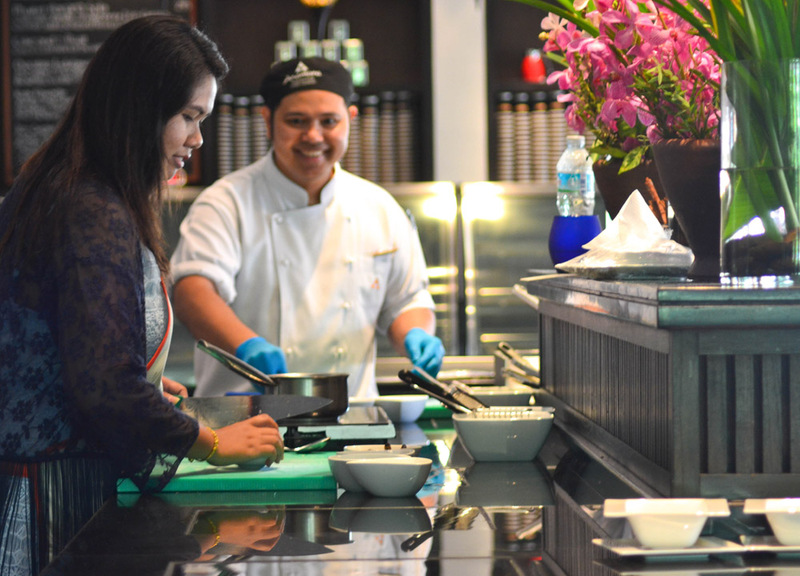 All the sweet, sour, salty and hot signatures of Thai cooking are there and all the recipes come home with us in our complimentary cook books. In all we cook 4 dishes and, accompanying the fresh spring rolls, are Tom Yum Koong a hot and sour prawn soup, Khao Soi a famous northern style noodle curry and Kluay Buad Chee a sweet dessert of banana in coconut milk. 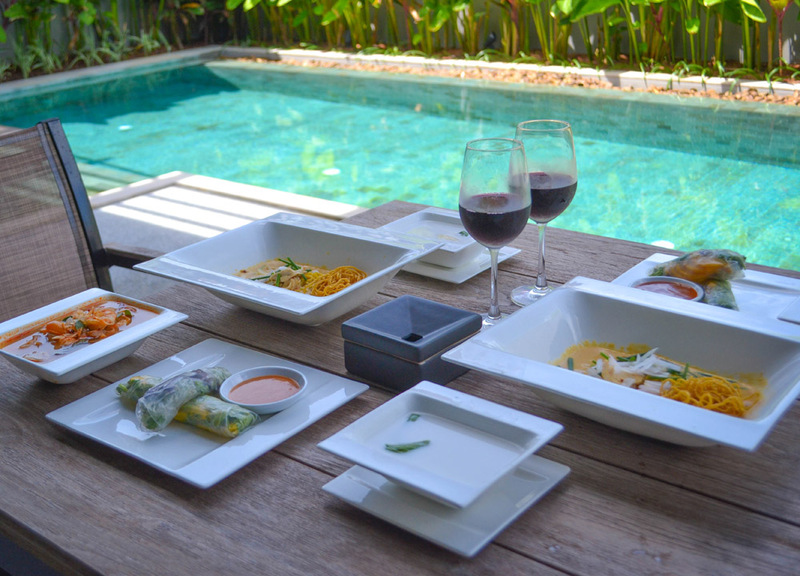 We make our way back to the villa where the cooking quickly joins us for the perfect setting next to the swimming pool. The scenery in this part of the world is unforgettable. If you’ve never explored the Andaman seas, be sure to put it top of your list. In the past we’ve explored the area from all sides, and directions yet we can’t help get excited for our next adventure. On this occasion we expect to retrace past routes and itineraries, only to be surprised with an entirely new list of tours we’d never even considered. 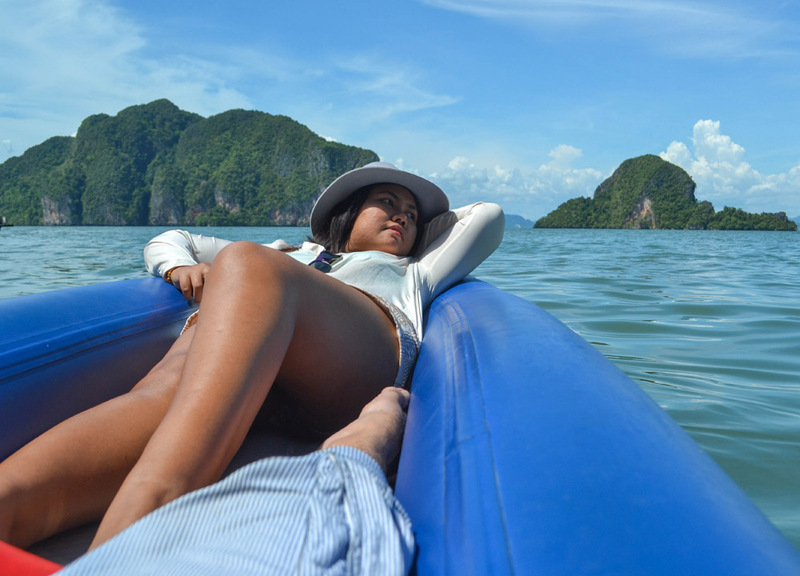 We go more adventurous this time with a kayaking tour of Phang Nga Bay led by a group of experienced kayakers. 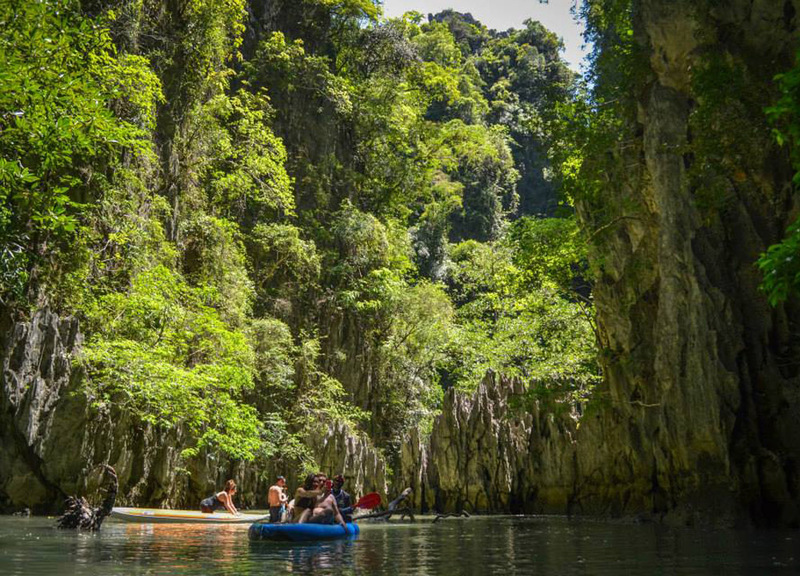 It is a lesser known tour, too dangerous for tourist kayakers to follow, so the scenes and experiences we find are ultimately less crowded. 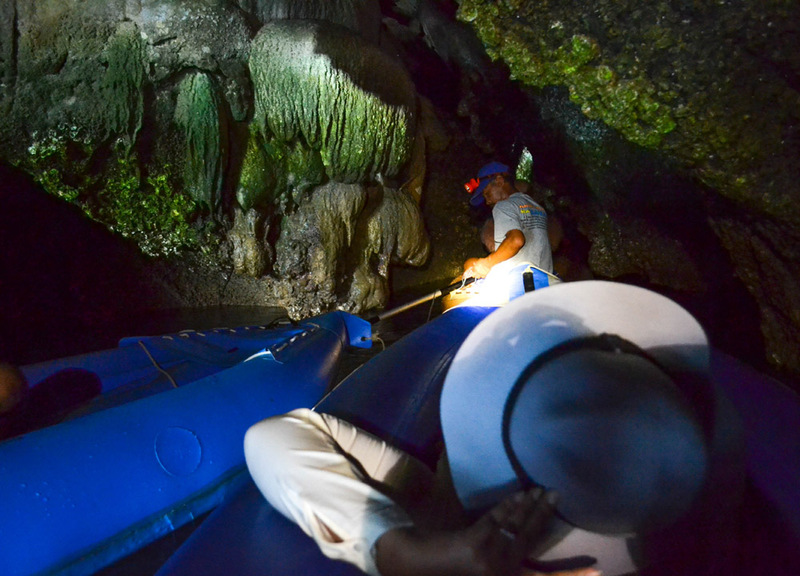 While much of the tour is relaxed, we do find ourselves squeezing through the tiniest of caves and crevices to reach seemingly unreachable lagoons. At times there is air let from our kayak just to let us squeeze through holes. Yes, it was a tad scary at times, but it was no doubt rewarding, as we find ourselves exploring hidden lagoons that can’t be accessed by any other means. Within the tall limestone walls we find a world like nowhere else. 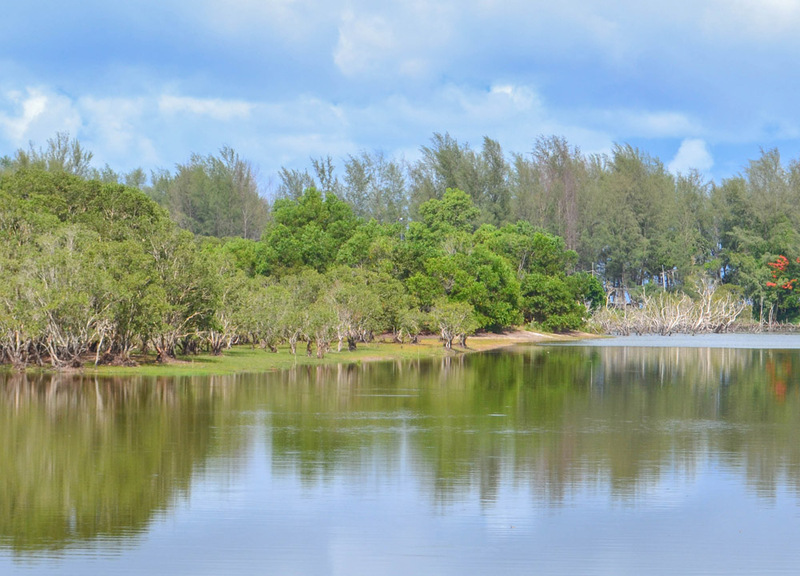 Saltwater mangroves sprout from soft sand seabeds and the waters sit still. The surreal silence is only broken by the echoes of a hornbill nesting in the trees and cliffs above. The surrounding sand banks are home to walking fish and fiddler crabs. This is just one of the many fascinating tour options available here and it is one we will not likely forget. Memories of a lifetime.